Small-scale developers weather the crisis well. Very often, when one considers a property for investment, one tends to consider those in the city. And when one thinks of developers, there is a tendency to consider the big, established players for fear of projects being abandoned. But what about the smaller players, some family-based business, in a little town far away from city life serving their community? Where are these companies heading? And how has the turmoil of the past year affected them? Or did it? Before going further, a big company does not become big overnight. One does not become rich out of the blue. It takes years of savings and investing, wise decisions and many other factors. From Skudai, Johor to holiday destinations like Langkawi in the north, from Peninsular Malaysia’s largest state to former tin state Perak, these small-scale developers share their views about the community they are building in, and for, and the effects of the global downturn. For three out of four of them, property development is their core business. Because they have years of experience in that community, they know the infrastructure and the market. On the whole, they have weathered the crisis well. Some, like YNH Bhd, have decided to venture out into the Klang Valley. Others, like Hua Yang Bhd which started out in the Valley, is venturing out to the little areas. Yet others are contended to stay put. Professionals working in the town centre can also consider Bandar Putra with its exclusive living and pretty surroundings. In 2003, a little-known developer from Manjung, Perak, YNH came to Kuala Lumpur. Manjung is about 80km from Ipoh, and is located between the city and Lumut, the getaway point to Pangkor, and Sitiawan. When it came to Kuala Lumpur, its choice of land was telling – Mont’Kiara and the Jalan Sultan Ismail vicinity. The family business was seeking its fortune in the city but it was not leaving behind its roots in Perak; it was, in fact, adding another pillar to its foundation. Come the fourth quarter, YNH will be handing the keys to buyers in both projects, Fraser Place, next to Wisma Hong Leong, in the city and Cerian Kiara in Mont’Kiara. Formerly known as Yu Neh Huat Bhd, the company was incorporated in 1985 as a family business. The late Datuk Yu Neh Huat was a farmer and livestock keeper. The company began constructing its first project – 10 units of double-storey shop offices – in the late 1980s. Its financial controller Chan Yan Meng says the company’s turning point came in 1995, with the Manjung Point township, a project of about 1,000 acres. It still has about 700 acres that are yet to be developed. “Although we may have ventured out to Kuala Lumpur, Manjung Point will continue to be our reference point. Today, YNH is a trusted and one of the largest developers with a strong base here,” says Chan, who has been with the company since 1990. Its staff strength has grown from 30 in 1990 to 250 today. Most of its customers are civil servants – mainly those at the naval base located there and teachers – and small holders. With 45% of its revenue coming from there and the rest from its projects in Kuala Lumpur, the company has diversified its market with a foot in the city. There are dozens of small-scale developers in and around the peninsula, Sabah and Sarawak. Many of them have humble beginnings and are contended to be where they are. In some ways, the economic downturn has not really affected them as much as the big boys. Says an analyst who declined to be named: “Housing development is still very much location based. If a developer is from a small town, it has to consider the local economy and demographics in that area. “In such a situation, there may be a tendency to expect sales to be poor because of the global economic woes but this need not be the case. Away from the city, these smaller developers have a captive market and they will still do relatively well. In terms of sales and earnings, it will be stable. “YNH, for example, sells to civil servants, and makes an average RM40mil to RM50mil sales annually in what many would consider as remote areas. Likewise, Pasdec Holdings Bhd in Pahang. “In Sabah, property sales are doing well in plantation areas because of the significant price of palm oil. So it really depends on locality. While some – Hunza Properties Bhd from Penang and YNH who have made their way into the city the last several years – there are many others who are contented doing what they are doing in these smaller towns. Klang Valley-based Hua Yang is scouring for projects outside the Valley where land prices are cheaper. Like YNH, Hua Yang is also a family-based business. Its Seri Kembangan mixed development is by far the largest project in its stable. Its chief operating officer Ho Wen Yan says it would like to focus on other markets in Perak, Johor and Seremban. He says the affordable mass market segment is the company’s core focus and contributes the bulk of Hua Yang’s revenue. In terms of customer demographics, most of them are first-time buyers comprising young couples who buy for occupation. “In the city, the story is different. There is the investor group who buys to sell, or to rent. So the present lull is an opportunity to grow our presence. “The bigger boys have gone into niche housing, resulting in a lack of affordable mass market housing in the RM90,000 to RM380,000 range. Our opportunity is to tap into this market,” Ho says. The company plans to launch several developments in the next six to nine months in Seremban, Senawang and Johor Baru amounting to about nearly RM120mil. Its Sg Besi project, comprising residential, commercial and retail, has a GDV of RM550mil. It is also pretty upbeat about its financials for 2010 with revenue of RM100mil in 2009, RM60mil in 2008 and RM63.5mil in 2007. In Pahang, the largest state in Peninsular Malaysia, land is in abundance. This is Pasdec Holdings home turf. CEO Mohd Khairuddin Abdul Manan says the company is best known for medium-cost houses comprising mainly single-storey terrace and semi-detached homes, which contribute 60% to the group’s turnover. Besides housing development and management, the group is also involved in construction, the manufacture of bricks and trading in building materials. The group recorded improved sales of its residential properties from RM32mil in 2007 to RM64.8mil in 2008. The projected sales for 2009 is RM81.8mil. The group has 2,500 acres of land, 90% of which are in Pahang. Pasdec expects revenue and profit to be affected due to market condition. Says Khairuddin: “Results for the first half of the year indicated a drop in our targeted turnover by 37%, we anticipate unfavourable results for the second half of the year. But we will look for ‘wow’ factors’, like public infrastructure and other amenities. The total GDV of the company’s five flagships projects, which are located in Kuantan, Pahang is RM1.98bil. Further north, Thong Sin Development Sdn Bhd has made Langkawi and Cameron Highlands its playing field. The company is best known for building apartments and serviced apartments, which contribute 70% to the company’s revenue. 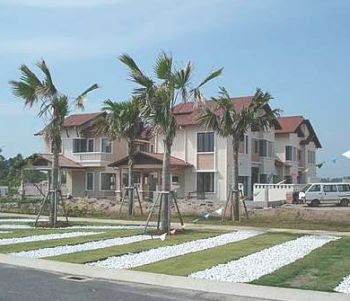 It has some double-storey and semi-detached units scattered about but overall, its forte is apartments. Born and bred in Penang, and having been in the business for the past 30 years, its managing director K. C. Tan is familiar with the infrastructure and the market he is operating in. The glass bubble lift overlooking the pool in Century Suria condominium. “The global downturn did affect us, but not too much. 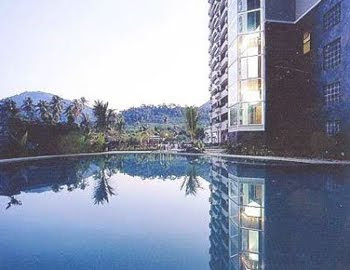 Century Suria condominium in Langkawi saw a drastic drop in response from foreign purchasers as a result of the global woes. Since second quarter 2009, sales have picked up for all the projects and continue to look encouraging from local buyers. We have 17 acres in Kuah, Langkawi and 2.5 acres in Cameron Highlands and we expect things to be stable and encouraging in the coming months,” he says. Valencia residents enjoy a private 9-hole golf course and country club. The concept of boutique developments is fast becoming an attraction in the property market nowadays. Gamuda Land Sdn Bhd managing director Chow Chee Wah says usually, the design of a boutique development is for the middle to high-end housing, catering to a special targeted niche market that has a discerning taste and appreciation for resort lifestyle living. “Gamuda Land has a few boutique developments, namely Valencia in Sungai Buloh, Jade Hills in Kajang and Madge Mansions in Kuala Lumpur. Both of these landed developments – Valencia and Jade Hills – are within the 300-acre range, while Madge Mansions, our high-end condominium is on 2.16 acres,” he says in an email. Chow defines Gamuda Land’s concept of a boutique development as one with a low density ratio and a host of other Oooomph! factors. “It has to be very exclusive, very private with top security features in placed. Added to that is the ambience and this includes a host of criteria – quality products, safety and security, tranquil environment, well-equipped facilities, status and class, and a good return on investment, he says. He says Gamuda Land first ventured into boutique developments in the year 2000 with Valencia. 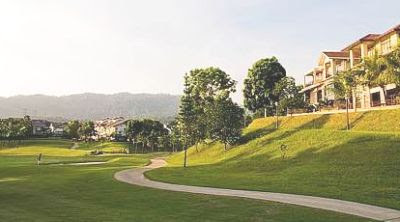 “This luxurious project became the first boutique development in Malaysia with a private 9-hole residents’ golf course and country club. Valencia soon became a much sought after address because it offers the perfect combination of living in a landed property with condominium living facilities. “It is a private, exclusive development within an environment equipped with the best resort facilities for a healthy and secure living lifestyle,” he says. Facilities and ambience aside, Chow says a boutique development is also about location. It has to be a prime address that an owner will be proud of. “It is about being a class above others,” he says. “Gamuda Land decided to undertake this type of projects because we saw a growing demand and need for it. In urban areas, especially in the Klang Valley, the growing population of the affluent and elite group are looking for residences that meet their needs and desires for fine resort living. “Valencia and Jade Hills testify to our success in this boutique home category. More than 60% of Valencia purchasers are repeat buyers. Thirty percent of Valencia’s residents today are expatriates, a large majority of them are Europeans. This means our boutique developments have become prime investments,” he says. Because developers saw the popularity of boutique properties, they are now beginning to offer boutique commercial developments. IRDK Land Sdn Bhd director Datuk Kevin Woo says such developments are not a trend but a need as the market evolves. “The difference between boutique commercial developments and other commercial developments is the concept and setting of the development. It gels the business with lifestyle elements by providing and facilities,” he says. The company is developing a boutique commercial development called Alam Avenue in Shah Alam, comprising 51 commercial units on three-storey intermediate shop offices and five-storey corner and end units. “The ground floor will have a floor to ceiling height of 4.5 metres (15 feet). It will be generously fitted with high quality zinc aluminium roller shutters of 10 feet high to give maximum advertising and showroom presence. These shops will have generous 17-feet verandas and walkways frontage to accommodate alfresco dining and cafes. They will be tiled luxuriously with homogenous floor tiles. Decorative light fittings will be installed at the walkways to enhance the ambience and to exude on easy flamboyant lifestyle where business and leisure meet in a quaint setting,” he says. The gross development value of the project is about RM100mil. It is scheduled to be completed by December next year. A green development is another concept introduce by developers. Sentral City (M) Sdn Bhd has gone one step further by incorporating a touch of Zen in its green concept development in Puchong Zen Residence@Asplenium condominium. General manager Pang Swe Haw says the word Zen has been widely used in different industries like food and beverages but nobody has attempted to define the true meaning and essence of Zen. “Zen is a living philosophy which centres around the simplicity and beauty of nature around us. “In Zen Residence, we aim to create landscape and architecture settings that encourage the residence to take a longer and closer look at the environment around them and hope they will be able to develop a greater insight and appreciation of nature. “So, we may not be the one who first use the word Zen, but we are the first to really explore and implement the Zen living concept,” says Pang. With GDV of about RM96mil, Pang says Zen Residence has achieved close to 90% sales to date. The company will continue to explore this concept in their next project that is currently on the drawing board. The property market is set to move into higher gear after the dreary days of project delays and deferment of the past one year. Despite the seemingly brighter days ahead, developers are treading carefully and have not completely lowered their guard on the market’s passiveness to avoid an over built situation that will send property prices southwards. While mulling over whether it is still too early to launch their projects, especially if they are green field developments that will take many years, developers should not completely withdraw from the market. Instead, they should stay in touch with their potential and existing buyers. Engaging their customers will enable developers to stay on top of things and know what their buyers want and plan their projects accordingly. Buyers’ needs are always evolving and developers who take the trouble to stay in touch with them will benefit tremendously. After all, customers know best what they want and they will be quite spontaneous to share their views if sought. They would appreciate developers who keep them posted on new initiatives and seek their views, especially for product development and improvement. These days, it is not unusual to receive newsletters and project brochures from developers. There are also announcements on new upcoming project launches to promote repeat buying. With the Internet, developers should go a step further and interact directly with buyers. By opening up the communication channel through a well managed and user friendly website, a participative virtual community will emerge among residents and buyers of their projects. An active two-way communication flow and interaction will promote a more well informed and knowledgeable society. In the process, developers will be able to get invaluable information first hand from their customers on how to design, or redesign, their projects. Developers who value their customers’ views and input will be able to have the right products in place, whether it is during the good or bad times. The tag line for developers these days should be to deliver real value for customers. A clear focus on customers will certainly go a long way to earn their lifetime loyalty. It is still very much a buyer’s market and property buyers now have many choices to choose from. Instead of building rows and rows of standard housing units or shop lots, it will be good if developers allow buyers to have some degree of flexibility in the interior layout plans of the property they are buying. For a start, this can include the number of rooms and their sizes, choice of colours, and materials used, to meet the different needs and budgets. Although such flexibilities are only practised in very high-end housing estates now, especially for houses with price tags of at least a few million ringgit onwards, the developer that is willing to extend this “magnanimous” gesture to the medium-range projects will, without a doubt, become an instant favourite. Many Malaysians are still practising the extended family tradition with their aging parents and grown-up children staying together in the same house, and catering to their differing needs will be a good act of corporate social responsibility on the developer’s part. Going by the earning capacity of the majority of average Malaysians, buying a decent house priced at slightly over RM300,000 is still a big commitment. To borrow for a property priced that cost RM300,000, a couple will need to have at least a combined monthly income of RM10,000. So the onus is on developers to offer greater value to house buyers and any gestures that show that they truly take great care to plan their projects to meet their buyers’ needs will earn them a more loyal following. Village or “kampung” environment has always been the preferred for many Malaysians until quite recently when rapid urbanisation and massive infrastructure projects changed the people’s living landscape and way of life. To many, it is still their preferred living environment as they like the stability of staying “grounded” in landed housing units and enjoy the closeness and camaraderie of their fellow villagers. To promote closer kinship among the people, one of the ways is to replicate the village–like features and environment in our new townships. ■ Deputy news editor Angie Ng believes that a return to more community-centric developments will be good to promote and revive a stronger bonding among the people, in line with the 1Malaysia aspiration.